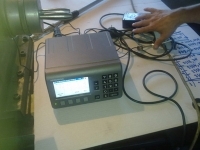 With the Diametrical and Oscillation Measurement Device (D.O.M.D.) there is the possibility to obtain real time measurements of the external diameter of all cylindrical parts, kiln tires and support rollers while they are rotating. 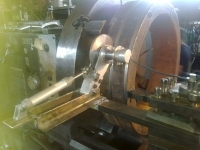 By adjusting properly a special probe the radial offsets of a rotating cylinder (oscillations) will be also obtained. Making the proper calculations you can define the eccentricity or the ovality of a tire or roller. 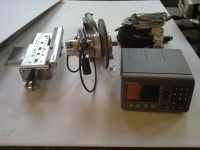 (1) Measurement wheel device as disk with 170,95mm diameter and 10mm width. (2) Control panel with NC data recorder & statistical analysis. Data are also send to PC computer using a serial part RS232 plug both from the PLC and to the computer. (3) Induction coil (switch) used for saving a measurement after a complete cycle of the roller or tire. (5) Measurement probe devise for diameter oscillation (optional). With this device the perimeters of tyres and supporting rollers are measured, enabling calculation of their diameters. This is done in order to evaluate the wear profile on the rolling surfaces and to align also the portable lathe. The measurements are taken with the equipment shown and the results appear on the data recorder unit, enabling us to calculate the nominal diameter of a rotated part. With the probe (5) the variations of surface and diameter are recorded in order to calculate fluctuations, kiln expansion and ovality.